South Central Regional Medical Center is set to host its 13th annual South Central Classic on Saturday, September 29th. 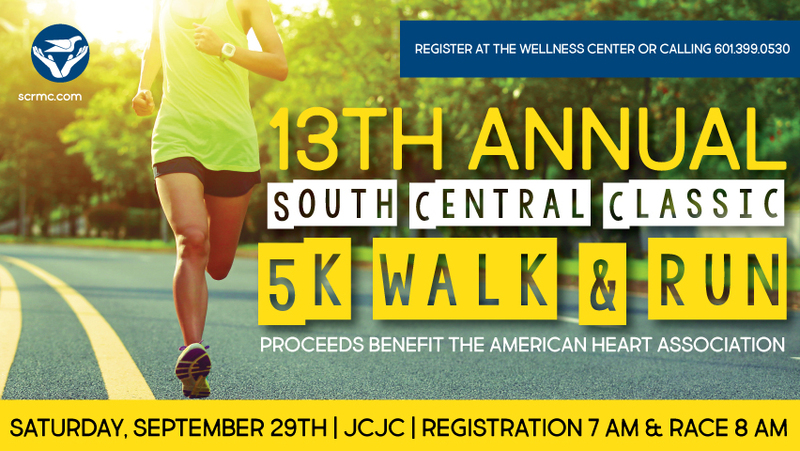 All proceeds from the South Central Classic 5K Run/Walk event will benefit the American Heart Association. The race and registration will be held in conjunction with the 2018 Heart Walk at Jones County Junior College in Ellisville. Registration starts at 7 a.m. on Saturday with the start time beginning at 8 a.m. The South Central Classic 5K is open to all interested participants. Entry fees are as follows: $25 for pre-registration, $20 for Wellness Center and Pine Belt Pacers Members, $27 for day of race. Forms can be picked up at the Wellness Center or CLICK HERE to Download Online. For more information, please contact Patrick Tibbs at 601.399.0530 or by email at Patrick.tibbs@scrmc.com.